Effect of heat shock on the expression of disease resistance response genes in pea. Catherine H. Daniels and Lee A. Hadwiger. Agronomic performance and background effects of the afila-tendrilled acacia pea foliage type: evaluation on wire trellises. I.L. Goldman and E.T. Gritton. Shortened internode length below the node of flower initiation in pea. F.N. Green. Orange pod phenotype found in an accession of Pisum fulvum Sibth. & Sm. originating from Syria. F.N. Green. Evidence for a new rugosus locus. C.L. Hedley, D.A. Jones, T.L. Wang, M.J. Ambrose, A.M. Smith, T.H.N. Ellis, L. Turner, P. Matthews, M. Bhattacharyya, W. Harwood, I.D. Bedford and F.N. Green. Variations in pod rehydration and permiability in three lines of Pisum sativum L. Simon N. Miles, David Price, Maria E. Donkin and Iain Swadling. The gi locus shows linkage with gp, r and tl. Ian C. Murfet. Internode length in Pisum. The genotype of Gottschalk's mutant 84B. J.B. Reid. Internode length in Pisum. The interaction of genes lv and lk. Mapping of a legumin subunit gene on pea chromosome 7. Purified guard cell protoplasts from the leaf epidermis of the argenteum mutant of Pisum sativum. S. Smith, J.D.B. Weyers, P.C. Jewer and H-O. H�gland. Is the locus for the gene het on chromosome 7 or 5? A new look at Lamprecht's linkage groups. W.K. Swiecicki. Linkage of a gene conferring toothed leaves. W.K. Swiecicki. A leghemoglobin gene cluster is located near D on chromosome 1 N.F. Weeden. Additional markers for chromosome 6. B. Wolko and N.F. Weeden. Flowering genes in pea and their use in breeding. Ian С. Murfet. The European Community Pea Group. C.L. Hedley. European Pisum database. P. Matthews and W. Swiecicki. 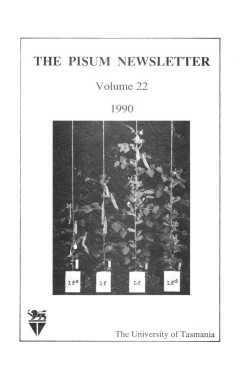 Collection of Pisum germplasm in Turkey in 1985 and 1989. F.J. Muehlbauer, W.J. Kaiser, Ziya Kutlu, and C.R. Sperling. The use of pea to study the plant genetics of symbiotic nitrogen fixation. T.A. LaRue. Mendel (1866) studied the inheritance of flowering behaviour but found the trait not amenable to clear analysis. It was not until 1915 that Hoshino identified a major flowering locus with some surety when he reported a gene for late flowering linked to a basic gene for anthocyanin production. White (1917) subsequently designated this locus Lf to avoid confusion over symbol duplication (Lf = Hoshino's A). Two further alleles, lfa and Lfd, were later identified by Murfet (1975). Reading left to right, the 49-day-old plants shown in the cover photograph are of Hobart lines 69 (lfa), 59 (lf), 65 (Lf) and 89 (Lfd). The plants commenced flowering at nodes 6, 9, 19 and 21, respectively. All lines are dwarf (le) and exhibit day neutral flowering behaviour (sn). Line 69 has a tendency to open two or more flowers on the one day, a characteristic of plants with allele lfa. Line 59 is a selection from the early market cultivar Massey. Line 65 was selected to occupy the upper end of the flowering node range for Lf sn plants which more commonly commence flowering in the range of nodes 12-17. Day neutral lines generally do not produce secondary stems from basal nodes but late day neutral types do have a strong tendency to produce aerial laterals and this trait is clearly apparent in lines 65 and 89. Line 89 also shows two other traits characteristic of Lfd sn plants, a reduction in internode length prior to the onset of flowering, and the hastening of flower bud development relative to leaf development so that the flowers open while still within the apical bud. References and further details are given in the review of pea flowering genes on pages 78-86.